I used to check my website stats several times a day. I’ll admit, I had a problem… but I’m guessing most bloggers have similar issues when first starting out. Well, I’m happy to say that I now check my website stats about once a week. And I check my “ebook stats” about once every two months since they’re found on another website. 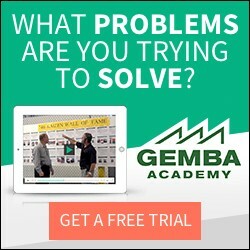 Well, it had been a few months since I had logged in to see how many people had downloaded the LSS Academy Guide to Lean ebook so I recently checked it out. I logged into my Aweber account and started digging around. After a few minutes I came upon some graphs I had never seen before. After some more digging and clicking I came upon the graph to the left (click to enlarge it). Upon first glance (the arrows weren’t there) I was fairly pleased with the nice slope. But the more I looked at it the more I felt like something was unique about the slope. It seemed like it intensified around November of last year. Well, being the lean six sigma nerd that I am… I decided to export the data into Minitab for some serious data analysis. 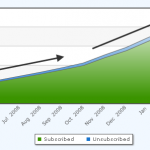 I applied some formulas in order to graph the number of new ebook downloads per month. With this data I then created the Individuals and Moving Range Chart to the left (click to enlarge). Well, as you can clearly see something definitely “happened” around November of 2008. 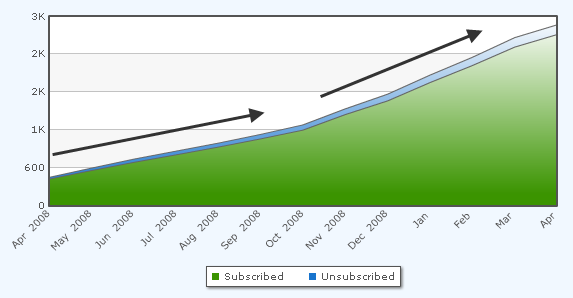 And while our website traffic has consistently grown, month over month, it hasn’t grown this much in one month. Something else had to be happening. But what? Then I remembered! Design Changes Make an Impact! Late last November I had my web design guy make a small tweak to the LSS Academy site. The tweak had to do with the ebook sign-up form. Basically I had him enlarge it. I also paid a guy a few bucks to design a really slick cover for the ebook. Well, it would seem that these small changes made a rather significant difference to the number of ebook downloads. Aside from being a good lesson on how important things like web design can be to a website’s performance, this experience also taught me how important it is to properly analyze data. Some folks may have stopped after looking at the first graph… but it wasn’t until the second graph, with control limits in place, that we could be sure that something truly significant occured. If you’d like to learn more about control charts, and don’t want to spend a dime, please check out these articles I’ve dusted off from the archives. Control Charts Part 1: In this article I explain what control charts are, their history, why control limits are +/- 3 standard deviations from the mean. How else would you have looked at my data? 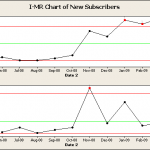 Have you used control charts successfully in your place of work? 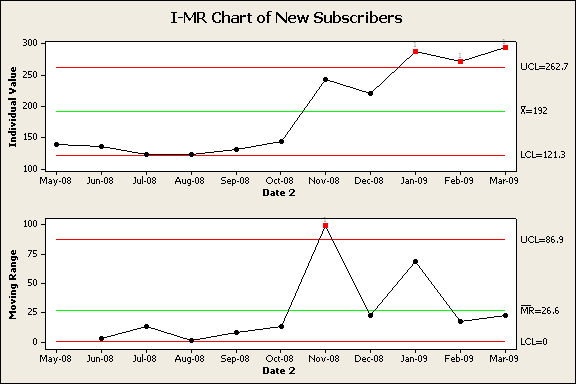 And what about my fellow bloggers… have any of you thrown your data into Minitab for a little fun? Nothing to do with external things like Presidential Election Results? Articles in the news about how well Toyota was still doing in spite of downturn in car markets especially compared to the Detroit Three with their hands out? Did you move up higher on Google’s hit list for some reason? Lots of factors… and no good way to find the “Red X”. Hi Chris, I checked to see if there was any correlation between my website traffic and the increase in downloads and there wasn’t. My traffic, almost since the day I started this blog, has slowly increased month after month… but no where near the percentage increase I saw after the design changes. So, I’m pretty confident the design changes are in fact the red X. You could always do a quick test, and put the old version up for a week to see if your conversion rate drops as would be expected. That would serve to confirm your suspicion that the design change was effective. If the rates stayed steady, it would point toward a different factor. Thanks for the comment, Bronwyn.